Upon the release of this book in June, there was a lot of hype surrounding it. People were praising its diverse themes and feminism, so naturally I knew that I wanted to pick it up and have a good time with it. Okay, here’s my problem. Although I definitely did appreciate the feminism, morals and diversity, Saints and Misfits didn’t really appeal in other ways to me. I found that the main protagonist was unmemorable and that the plot moved much too slowly for me to get the most out of it. This novel basically follows high schooler Janna. Being Muslim, a photographer, and a bookworm, she is very different from her peers and has trouble fitting in. Although her family tells her that she’s not allowed to date, she finds herself falling for a guy named Jeremy. If she does decide to break the rules and date him, will she still be respected in her Muslim community? As I mentioned before, Janna was a dull and forgettable character. I liked that she had eclectic interests (for the record, all that most contemporary protagonists do is hang out with their friends and love interests), but for me, they just weren’t explored nearly as much as they could have been. I was super excited to hear how much Janna adores books, but if there was anything about it, it was in the tiny details of the story that I sometimes don’t tend to absorb. Hence the fact that the pacing of this story was quite slow, I was never able to find myself completely engrossed. There were a lot of references to Muslim culture that I found hard to understand and process in my mind, and even though I appreciated the tiny bit of acquired knowledge about the culture, I know I am bound to forget it soon enough. Also, there wasn’t nearly enough swoon-worthy romance and this really disappointed me! Isn’t this technically supposed to be a romance story? 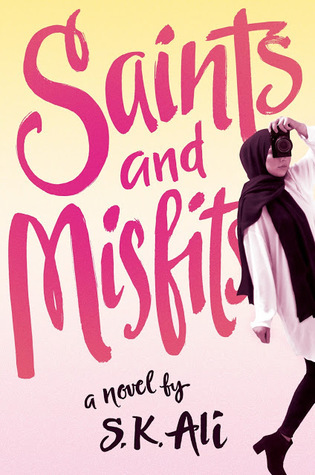 Overall, Saints and Misfits was a rather mediocre, unmemorable novel about embracing your identity and fitting in. It may not have been written with me in mind, but there is definitely potential for it to appeal to many other readers. Do you like huge loads of diversity, feminism, and coming-of-age morals in your books? If so, then go ahead and pick this one up- I can’t guarantee you’ll devour it, but I’m sure you’ll still enjoy it. I couldn’t really read this book like I started but the writing style or something put me off, I didn’t get far in it.